An Irish Blog would be incomplete without a Limerick so here is my own personal one dedicated to Donna, my love, my life, and my bride of 44 years. Who fell in love with a girl in Eritria. He asked, Will You be Mine? She replied, Suits Me Fine! Hence four joyful decades with Donna Maria. Yes here it is St. Patrick's day, the day when it seems that everyone is at least a teensy weensy bit Irish. 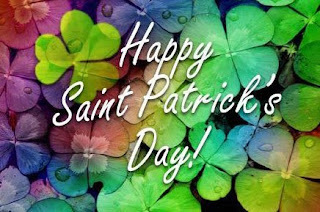 St. Patrick was born in Britain during the fourth century to very wealthy parents as Maewyn Succat. He was kidnapped by Irish raiders at the age of sixteen, sold into slavery,and forced to work as a shepherd in Ireland's County Mayo. One night he had a dream of escaping the following day and returning home. The next day he did just that, traveling 200 miles back home to Britain. Back home he had a second dream, this time it was of an Angel instructing him to become a priest, return to Ireland as a missionary, and spread Christianity. During the next fifteen years he entered training, became a priest, and choose Patrick as his Christian Saint name. 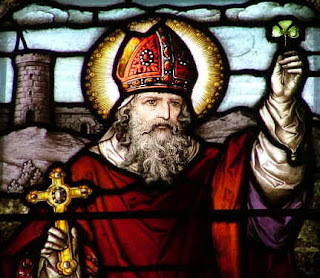 In 432 AD he went back to Ireland as a priest attempting to convert the Irish people to Christianity from their pagan polytheistic religion which worshiped the sun and the moon. He created and taught at many schools along Ireland's west coast. One of his teaching methods included using the shamrock to illustrate the Holy Trinity. After nearly thirty years of teaching and spreading God's word he died on March 17th 461 AD. Shortly after his death the country of Ireland elected to remember his death with a day of his own and thus St. Patrick's Day was born. To offer a national festival promoting excitement throughout Ireland via innovation, creativity, grassroots involvement, and marketing activity. To provide the opportunity and motivation for people of Irish descent, (and those who sometimes wish they were Irish) to attend and join in the imaginative and expressive celebrations. To project an accurate image of Ireland as a creative, professional and sophisticated country with wide appeal, as we approach the new millennium. 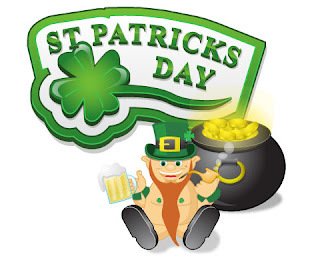 The first Saint Patrick's Festival was held on 17 March 1996. By 2009 over 675,000 people attended the parade. Overall last year's five day festival saw close to one million visitors that took part in the festivities that included concerts, outdoor theater performances, and fireworks. Today, Saint Patrick's Day is widely celebrated in America by Irish and non-Irish alike. Many people, regardless of ethnic background, wear green-colored clothing and items. Traditionally, those who are caught not wearing green are pinched, usually affectionately. 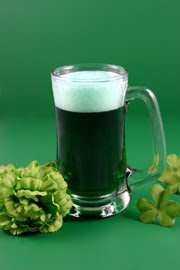 Of course many follow the honored Irish example by drinking plenty of beer. Seattle and other cities paint the traffic stripe of their parade routes green. Chicago dyes its river green with forty pounds of dye, the color lasts for several hours. Indianapolis also dyes its main canal green. Missouri University of Science and Technology alumni paint 12 city blocks Kelly green with mops before the annual parade. New York's Chadakoin River in Jamestown, a source for Chautauqua Lake, is dyed green yearly. 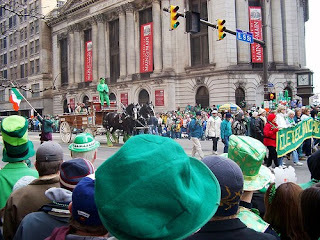 Locally Cleveland's St. Patrick's day celebration is one of the city's largest and best attended annual events. The colorful parade which has occurred each year since 1867 is the largest in Ohio and one of the largest in the nation. Everyone of prominence in the community participates whether they are Irish, Scottish, Polish, Chinese or what have you. You are likely to find Catholics, Protestants, Muslims, Jews, Hindus, and who knows what. People of every Origin, Religion, and Race will be Irish for a day. No one with political aspirations would dare to miss appearing in the parade. Then there is the partying after the Parade green bear and all. 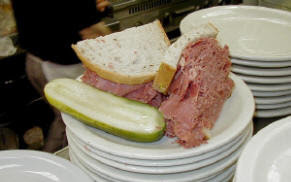 Although not authentic to Ireland, no American St. Patrick's Day celebration would be complete without corned beef and Cleveland serves some of the best. Try Slyman's Restaurant on E 31st St and St. Clair. They start at 6am with corned beef and eggs and move right into Reubens and stacked high corned beef sandwiches for lunch. It is quite a day here.